Last night Kerry Rhodes and Terrell Owens supported the 134th Kentucky Derby - 3rd Annual Bowl for the Roses. 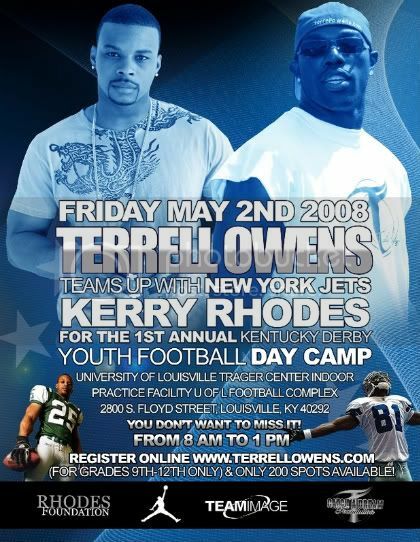 Today Kerry and Terrell support their own charities and foundations by presenting the 1st Annual Kentucky Derby Youth Football Camp (May 2, 2008) in Kentucky. Rhodes, who was drafted from University of Louisville holds Kentucky very dear to his heart and is excited about doing something in one of the states he considers like home. Also Today (May 2, 2008) from 4pm -6pm at the Spectrum Building located at 911 South Brook Street Louisville, KY 40203 everyone can come out and enjoy the celebrity basketball game that will include your favorite celebrities with Kerry and Terrell on one team and the And1 players including "Hot Sauce" on the other team.